I'm investigating logging options as I will be setting up a Mac in my Shack when I get one up there. Here is a shot of the medocre shack as it is right now. 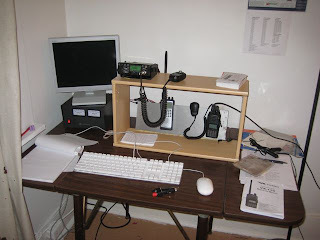 There is a copper jpole and a Diamond MR77 on a cookie sheet in the attic room connected to these two radios. I'm probably going to go with Aether as it's the most modern Mac logging app. MacLoggerDx is of course the standard but I'll try the new cocoa guy see how it goes.